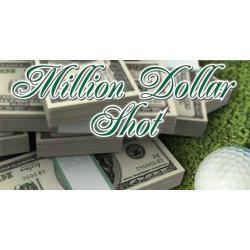 Add Excitement to your next golf outing with a shootout contest. Everyone loves a shootout contest and everyone, except pros can participate. It is very easy to conduct a shootout contest, before or after your golf event. I like to host my shootout contests before the outing starts. I mean right before the outing starts. I like to have everyone watch on either the 1st or 18th green. Basically you want everyone to see the putting green from a distance to really add excitement. When the pro is giving announcements or the tournament chair welcomes everyone to the event you can pull a name out of a hat. From there, the winner or winners take a swing from 165 yards for a chance to win a grand prize. Usually cash from $10,000 to a million dollars. You will want to have PGA/LPGA Professional witness the swing or swings. You will also need to video tape the swing or swings, the air flight and the ball landing on the putting green. Complete the form below and add excitement to your next golf outing with a shootout contest! Pricing is based on amateurs only. Non Touring Pro, Touring Pro, PGA Tour Pro, LPGA Tour Pro, Current or Former Professional Athletes are not eligible. Pricing is determined by the number of swing attempts, payout timeframe, and the prize value. All finalists swing attempts must be videotaped. The videotape must include the measurement of the putting distance, ball placement, and the ball being struck and ending up in the bottom of the cup. All swing attempts must be videotaped and witnessed by two witnesses, one being a PGA/LPGA professional from the golf course.